The Chinese word "Qi" translates in English to "energy". Qi is the energy or natural force which fills the universe. The Chinese believe in Three Powers (San Cai) of the universe: Heaven, Earth and Human. The Chinese word "Qi" translates in English to "energy". Qi is the energy or natural force which fills the universe. The Chinese believe in Three Powers (San Cai) of the universe: Heaven (Tian), Earth (Di) and Human (Ren). Heaven Qi is the most important of the three, consisting of forces exerted by heavenly bodies, such as sunshine, moonlight, gravity and energy from the stars. Weather, climate and natural disasters are governed by Heaven Qi. Every energy field strives to stay in balance, so when Heaven Qi loses its balance, it will rebalance itself, through wind, rain and even tornadoes and hurricanes. Earth Qi is controlled by Heaven Qi. Too much rain forces a river to flood or change its path, but without rain, vegetation will die. The Chinese believe Earth Qi is made up of lines and patterns of energy, as well as the earth’s magnetic field and the heat concealed underground. These energies must also be in balance, otherwise disasters such as earthquakes occur. When Earth Qi is balanced and harmonized, plants grow and animals thrive. Finally, each individual person, animal, and plant has its own Qi field which always seeks balance. Losing Qi balance, an individual sickens, dies and decomposes. All natural things, including mankind and our Human Qi, are determined by the natural cycles of Heaven Qi and Earth Qi. Throughout the history of Qigong, people have been most interested in Human Qi and its relationship with the energies of Heaven and Earth. In China, Qi is also defined as any energy which demonstrates power and strength, be it electricity, magnetism, heat or light. 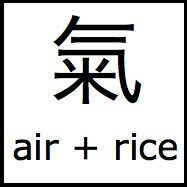 Electric power is called electric Qi (Dian Qi), and heat is called heat Qi (Re Qi). The weather is called Heaven Qi (Tian Qi) because it indicates the energy state of the heavens. When a person is alive, his body’s energy is called Human Qi (Ren Qi). Qi also expresses the energy state of something, especially of living things. When something is alive it has Vital Qi (Huo Qi), and when dead it has Dead Qi (Si Qi) or Ghost Qi (Gui Qi). When a person is righteous and has the spiritual strength to do good, he is said to have Normal Qi or Righteous Qi (Zheng Qi). The spiritual state or morale of an army is called its Energy State (Qi Shi). Qi can represent energy itself, or the state of the energy. It is important to understand this when you practice Qigong, so your mind is not channeled into a narrow understanding of Qi, limiting your future understanding and development. But now we will discuss the narrower definition of Qi that people today are most familiar with. Among the Three Powers, the Chinese have been most concerned with Qi affecting human health and longevity. After four thousand years emphasizing Human Qi, when people mention Qi they usually mean the Qi circulating in our bodies. In ancient Chinese medical and Qigong documents, the word Qi was written “ ”. This character consists of two words, “ ” on top, which means “nothing”, and “ ” at the bottom, which means “fire.” In ancient times, physicians and Qigong practitioners attempted to balance the Yin and Yang Qi circulating in the body, so there was “no fire” in the internal organs. Each internal organ needs a specific amount of Qi to function properly. If it receives an improper amount, usually too much which makes it too Yang or over-energized, it starts to malfunction, in time causing physical damage. The goal of acupuncture and the ancient qigong precursors, Dao-Yin (guiding and leading) and Tu-Na (utter and admit), was to attain a state of “no fire,” which eventually became the word Qi. In China, the word “Gong” is often used instead of “Gongfu” (Kung Fu), which means "energy and time". Any study or training which requires energy and time to achieve is called Gongfu. It can be applied to any special skill or study requiring time, energy and patience. Qigong is a science which studies the energy in nature. The main difference between this energy science and Western energy science is that Qigong focuses on the inner energy of human beings, while Western energy science pays more attention to the energy outside the human body. When you study Qigong, it is worthwhile to consider the modern scientific point of view, and not restrict yourself only to traditional beliefs. The Chinese have studied Qi for thousands of years, recording information on the patterns and cycles of nature in books such as the Yi Jing (The Book of Changes, 1122 B.C. ), which describes the natural forces of Heaven, Earth, and Human. These Three Powers manifest as Heaven Qi, Earth Qi, and Human Qi, with their definite rules and cycles. The rules are unchanging, while the cycles return to repeat themselves. The Yi Jing applies these principles to calculate changes in natural Qi, through a process called The Eight Trigrams (Bagua). From the Eight Trigrams are derived the 64 hexagrams. The Yi Jing was probably the first book describing Qi and its variations in nature and man. The relationship of the Three Natural Powers and their Qi variations were later discussed extensively in the book, Theory of Qi’s Variation (Qi Hua Lun). Human Qi has been studied most thoroughly, encompassing many different aspects. The Chinese believe Human Qi is affected and controlled by Heaven Qi and Earth Qi, and that they in fact determine your destiny. By understanding the relationship between nature and people, and also Human Relations (Ren Shi), you may predict wars, the destiny of a country, a person’s desires and temperament, and even their future. However, the greatest achievement in the study of Human Qi is in regard to health and longevity. Since Qi is the source of life, if you understand how Qi functions and know how to regulate it correctly, you may live a long and healthy life. As a part of nature, you are channeled into its cycles, and it is in your best interest to follow the way of nature. This is the meaning of Dao (Tao), which can be translated as the Natural Way. Read Basic Concepts of Qi and Qigong Part 2.